Monday Motivation — What NOW are you creating? What NOW are you creating? What are you going to be when you grow up? Who are you going to spend the rest of your life with? How are you building your career? Are you making enough money to retire on? Is anyone going to know who you are from your work? When will you finally be happy? All interesting and important questions everyone will ponder at some point or another. 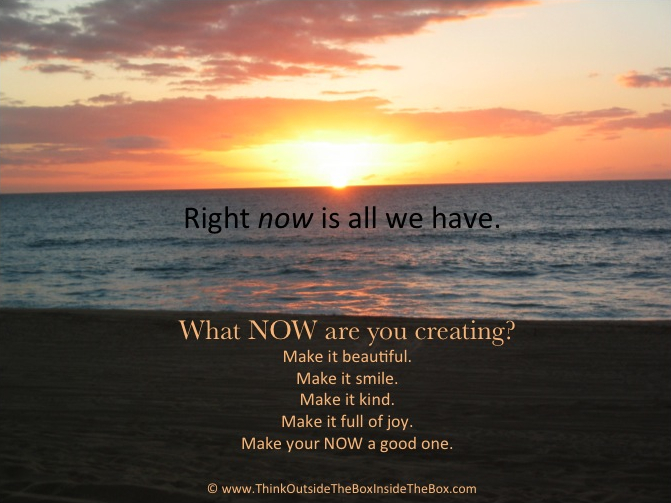 But the most important question you need to answer right now is what NOW are you creating? Right now is all we have. Yes, you want to be something amazing when you grow up. Yes, you want to spend the rest of your life with someone you love. Yes, you want to build your career into something amazing. Yes, you want to make enough money to retire on. Yes, you want to leave a positive legacy from your work. Yes, you want to someday be happy. Plan for all of that and create it. And then think, what about right now?!? What if you focus on creating right now, this moment, to be amazing, beautiful, full of joy, kindness, smiles and love? See what happens. See how many NOWs you can string together to create a beautiful life.